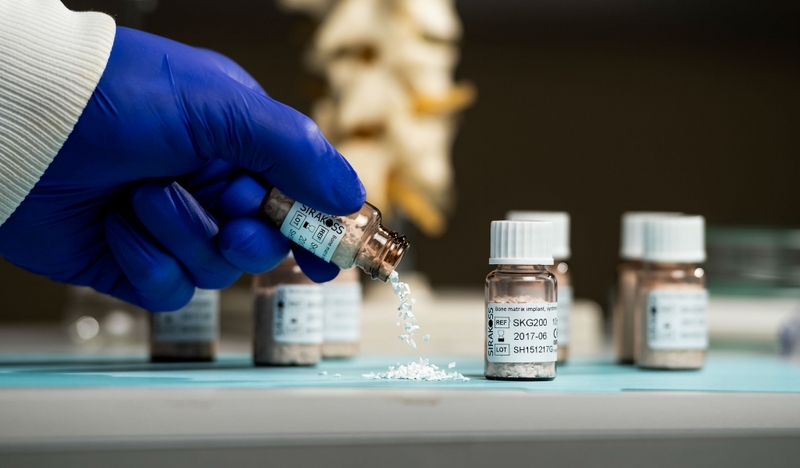 University spinout SIRAKOSS is a developer of synthetic bone graft substitutes designed to transform the treatment of spinal fusions and bone defects. In a development that represents new hope for repairing challenging bone fractures, a University spinout has received a CE mark for a synthetic bone graft substitute. SIRAKOSS Ltd has announced it has been granted CE Mark clearance in the European Union (EU) for Osteo3, the nanosynthetic bone graft substitute designed to improve patient healing. The CE marking is a certification mark that indicates conformity with health, safety, and environmental protection standards for products sold within the European Economic Area (EEA). This new technology has been designed to provide patients with more complete healing as well as allowing less time under anaesthesia, when it is launched into hospitals. SIRAKOSS, which spun out from The University of Aberdeen in 2011 is a developer of synthetic bone graft substitutes that are designed to transform the treatment of spinal fusions and bone defects. This offers surgeons a more advanced solution for repairing bone fractures. Synthetic bone grafts are used to fuse bones together during surgery to correct congenital or degenerative conditions, such as curvature of the spine, or following a traumatic injury where the bone fails to heal.